ahaihai [a-hai-hai]. adj. See above. Ka manu ahaihai kanu awa e, the bird breaking off the awa plants. ahu ʻawa. n. kava dregs. aka₅. n. knuckles, as of hands or ankles; joints of the backbone; node and stalk of kava; kava slip for planting. ʻākaʻakaʻa [ʻā·kaʻa·kaʻa]. redup. of ʻākaʻa, to tear off, peel... peeled, as the skin by sunburn or by drinking kava; peeling; ruffled. fig., exhausted, thin. akaakaa [a-kaa-kaa]. s. The falling off of the scarf-skin after a course of drinking awa. Ua mahuna i ka awa, Ua akaakaa ka ili, He puahilohilo ke kua i ka lepo, Ua akaakaa. aumiki₂ [au·miki]. n. fresh water mixed with noni juice, drunk after kava. aumiki [au-mi-ki]. s. Water kept in a calabash, and the chief drinks awa, (which is very bitter,) then drinks this water, which he thinks is sweet. aumiki₃ [au·miki]. same as miki₂, to sip. awa [a-wa]. s. Name of a plant, of a bitter acrid taste, from which an intoxicating drink is made. The name of the liquor itself expressed from the root of the plant; the drinking of awa causes the skin to crack and flake off for a time; i ka manawa e inu ai kekahi i ka awa, he maikai kona ili ke nana aku; a mahope, mahuna ka ili, nakaka, puehoeho, inoino loa ke nana aku. ʻawaakāne [ʻawa-a-Kāne]. same as ʻawa liʻi, a variety of kava. it is said that the god Kāne brought the first ʻawa to Hawaiʻi. ʻawa ākea [ʻawa ā·kea]. n. a variety of kava with long, light-green internodes and reddish nodes. also ʻawa maha kea, ʻawa mākea. ʻawa ʻapu. n. a variety of kava. ʻawa hiwa. n. a variety of kava with long internodes. ʻawaikū [ʻawa-i-kū]. n. kava root dug ceremonially by a priest and held up (kū) towards heaven while chanting a prayer of consecration and eulogy, after which the root was termed ʻawailani. ʻawa kua ʻea. same as ʻawa nēnē, a spotted variety of kava. ʻawakūmakua [ʻawa-kū-ma-kua]. n. a variety of kava with green internodes of medium length. ʻawa lau, ʻawalau. n. a young kava plant (root, stem, and leaves) used as an offering to the gods. ʻawalauakāne [ʻawa-lau-a-Kāne]. same as ʻalaʻala wai nui₁, a succulent related to kava. ʻawa liʻi. same as ʻawaakāne, a variety of kava. ʻawa mākea [ʻawa mā·kea]. n. a variety of kava. ʻawa mānienie [ʻawa mā·nie·nie]. n. a variety of kava with smooth, white stalk. ʻawa mōʻī. n. a variety of kava with short, dark-green internodes and whitish nodes, called ʻawa papa mōʻī at Kaʻū, Hawaiʻi. ʻawa nēnē [ʻawa nē·nē]. n. a variety of kava with long, spotted internodes. also ʻawa kua ʻea. ʻawa papa. n. a variety of kava with short internodes and spotted stalk. This name may be qualified by the terms ʻeleʻele, mōʻī, and kea (or keʻokeʻo), the last being the commonest variety, and whitish in general appearance. eia kā. idiom. so at last, then. Koʻu moe akula nō ia i ka ʻona a ka ʻawa, eia kā, ua hāpai ʻia mai au a loko nei o kou hale.I was just sleeping then with the drunkenness of the kava, and then I was carried here to the inside of your house. Hā ke akua i ka lewa.God breathed into the open space. Ka hā o kona waha.(2-Tes. 2.8), the spirit of his mouth; (Ioba 15.30), the breath of his mouth. haiā wahine₁ [hai·ā wahine]. n. female retainer of a chief. haina. n. offering, sacrifice. cf. hai, to sacrifice. hale pua niu. n. house where offerings of bananas, coconuts, and kava were kept, said to be offered in ceremonies deifying a deceased person or making him into a lizard god. lit., coconut-blossom house. haona. same as hao₃, ₄, scoop, grasp, plunder; come with force, as wind or rain...; handful, scoopful; receptacle, as a dipper for kava. hīnālea₁ [hīnā·lea]. n. small- to moderate-sized, brightly colored wrasses, family Labridae. In addition to those listed below, hīnālea may be qualified by the terms ʻeleʻele, līpoa, lolo, nīʻau, nuku ʻiʻiwi, nuku ʻiʻiwi ʻula, nuku ʻiʻiwi uli, nuku loa, nuku loa ʻeleʻele. cf. ʻōpule. hīnālea was eaten raw as an aftertaste for kava. It was prepared in the iʻa hoʻomelu fashion with kukui nuts and chili pepper [nīoi]; as this had a somewhat offensive smell, the phrase ipu kai hīnālea, dish of hīnālea sauce, was applied rudely to one with unpleasant breath, especially if he had the iʻa kui, nasal discharge. hiwa₃. a term qualifying coconuts and kava. see niu, ʻawa. hokaʻawa. n.v. to strain kava; a kava strainer. holowaʻa₁, holoaʻa [holo·waʻa, holo·aʻa]. n. trough, especially vessel in which kava was mixed; oblong box, coffin, chest, cradle; furrow, as for planting sugar cane. Kau i ka lani ka holowaʻa ua o Hilo.Placed in the heavens is the rain trough of Hilo [admiration for one of regal bearing]. hope₅. n. second brew of kava. iʻa inu. n. fish or relish eaten after kava. (For. 6:503) Usually called pūpū. inu ʻawa. n.v. kava drinker; to drink kava. kāʻawa. n. large bowl in which kava was mixed and strained (short for kānoa ʻawa). kānana₁ [kā·nana]. nvt. sieve, strainer; to strain, as kava in fibers; to filter, winnow (Ruta 3.2) ; to sift, as flour. also kālana. kanoa [ka-no-a]. adv. Externally; outside; applied to the dish containing awa; e poepoe kanoa, e hae kanoa. kapukapu kai [kapu·kapu kai]. same as kapu kai; to purify by sprinkling with salt water (kava, ordinarily taboo to women, might be made noa or free of taboo by sprinkling the place in this fashion; usually termed pī kai). koʻo lani. n. help given to a chief. ʻAwa koʻo lani.Kava that gives strength to a chief. Maʻa ia i ke koʻo lani.He is accustomed to giving all support to the chief. kua₈. n. third brew from kava. cf. mahū, hope. kuaʻea. n. same as nēnē, a variety of kava. lit., turtle back. kuaʻiʻo. n. a strong brew of kava. cf. kua₈. kuʻi lena. n. molar tooth yellow with age; insulting reference to old person. kupaliʻi₃ [kupa·liʻi]. n. a variety of kava with very small leaf. laho paka. n. crinkled scrotum (implication that there has been excessive drinking of kava). lau ʻawa₁. n. kava leaf. lau ʻawa₂. n. first two or three taro leaves, as offered with kava leaves with prayers for a good food supply. lelea [le-le-a]. s. The kapu which the priest imposed upon awa while the chief was drinking it. Lumilumi ʻia lāua e ka ʻona o ka ʻawa.They were overcome by the intoxication of the kava. lumilumi [lu-mi-lu-mi]. v. To act foolishly; to act wickedly; to do slovenly; e hana ino, kapulu, opiopi inoino; to be in a state of drunkenness and debauchery; ua lumilumiia laua e ka ona a ka awa. Laieik. 203.
mahakea₃ [maha·kea]. a variety of kava, usually called mākea. • having two branches or forks. māhuna₁ [mā·huna]. nvi. scaly appearance of the skin, as resulting from excessive kava drinking; to scale thus. PCP *ma(f,s)unga. mahuna [ma-hu-na]. s. Ma and huna, a particle; small; fine. The scaly appearance of the skin after drinking awa; the chapping, cracking or breaking up of the skin; i kona wa i inu ai i ke awa, maikai ka ili, a mahope, mahuna ka ili, nakaka, puehuehu, inoino loa kona kino. mama [ma-ma]. v. To chew with a view to spit out of the mouth; to chew or work over in the mouth; hoomakaukau iho la ia e mama i ke kukui; to chew or grind in the mouth, as the Hawaiian doctors do some of their medicines. NOTE.—When the substance chewed is to be swallowed, the action of chewing is nau. Hoolale koke ae la ke kuhina e mama i ka awa. Laieik. 34. adj. Chewed; masticated; kona mau mama awa, persons whose business it was to chew awa to make intoxicating drink. Laieik. 88. Pehea ka maʻi? Ua komo kahi māna ʻai.How is the patient? He has taken a little nourishment. mānoanoa [mā·noa·noa]. redup. of manoa, mānoa, numerous, very many...; thick, solid, vast...; dull-witted, stupid, calloused, coarse, numbed, as the tongue from chewing kava. Mānoanoa ke kapu o ke aliʻi.The chief has many many taboos [is of high rank]. maukoli₄ [mau·koli]. vt. to offer to the gods, as food. mokihana₂ [moki·hana]. n. a variety of kava famous on Kauaʻi; it has short, stubby internodes. It is named for the mokihana fruit because of its fragrance. He iʻa anei kō ka mākeke? ʻAʻole, he oki loa!Is there fish at the market? No, all gone. ʻolo₁. n. long gourd container used as a receptacle, as for kava or water; long body of a gourd used as a hula drum cf. heke, ipu. cf. ʻolo ʻawa. olo ʻawa. n. an address to a deity accompanied by an oblation of kava. ʻolo ʻawa. n. coconut shell cut lengthwise as a cup for kava. ʻoʻoki₂. vs. to take effect, as intoxication. opū. n. var. spelling of ōpū₁, clump, as of sugar cane, bananas, kava; cluster. cf. pū₄. ōpū₁, opū [ō·pū]. n. clump, as of sugar cane, bananas, kava; cluster. cf. pū₄. see ex. ʻahuʻawa. paholei. n. var. spelling of pāhōlei, legendary name for kava. pahuʻa. nvs. unsuccessful, ineffective, ruined, spoiled; lack of success. Ka pahuʻa o ka ʻawa i ke keiki.The lack of effect of the kava on the child. pākīkī₁ [pā·kīkī]. redup. of pākī₁; to crush, as pandanus aerial roots with a stone in order to obtain fibers for kava strainers. PCP *paatiitii. papa₅. n. a variety of kava. The name may be qualified by the colors ʻeleʻele, kea. papa hana₂. n. ceremony for the gods, as in offering kava. pāpāia [pā·pā·ia]. n. an offering or place for offering, as of kava. papa kea₂. n. see papa₅, a variety of kava. pua niu₁. n. coconut flower. pūʻawa. n. var. 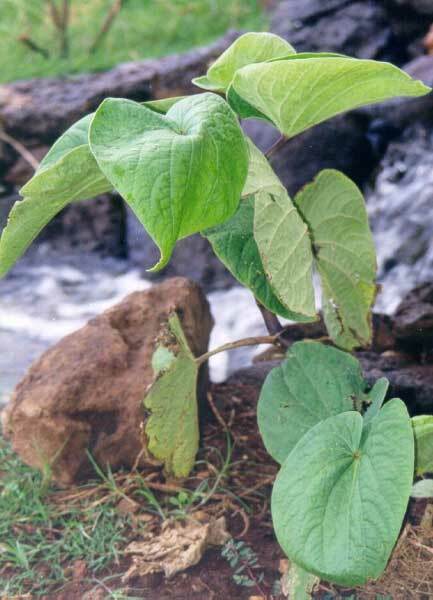 spelling of pū ʻawa, kava plant or root portion, formerly used as offerings. pū ʻawa, pūʻawa. n. kava plant or root portion, formerly used as offerings. see ʻike₁. puawa [pu-a-wa]. s. The root of the awa plant; a small awa plant; he wahi puaa, he moa lawa, me ka puawa. Laieik. 49.
puku₂. nvt. final offering; to end. pūpū₃ [pū·pū]. nvt. relish, appetizer, canapé, hors dʻoeuvre; formerly, the fish, chicken, or banana served with kava; to eat a pūpū. cf. pū₉. PPN *puupuu. puʻukaʻa, puʻu-kaʻa [puʻu·kaʻa]. n. a coarse native sedge (Cyperus ferax var. auriculatus), growing in marshes. It has long narrow leaves, and many tiny flowers are borne at the top of a stem. 6 to 1 m high, in a large ray-shaped head. stem .6 to 1 m. high, in a large ray-shaped head. Formerly, when ʻahuʻawa was not available, the fibers of this sedge were used for straining kava. also mauʻu puʻukaʻa, pūkoʻa, puʻukoʻa. C. trachysanthos on Niʻihau. cf. kāhili kāpopo, kiolohia. puʻupuʻu₄ [puʻu·puʻu]. n. eyes at a joint, as of sugar cane or kava. Ē ka ʻohu kolo ē, hoʻoua ʻia mai i ulu ka ʻawa.O creeping mist, make it rain so that the kava will grow.